High performance swimming pool calcium descaler, iron stain, scum remover and preventative. First pourable product that removes hard water buildup throughout pool surfaces, tile and all equipment without scrubbing or acids. Pour directly into pool water. Highly effective in preventing iron, copper, and manganese stains. Powerful Synertec formula provides long lasting, affordable protection year-round with just a small monthly application. 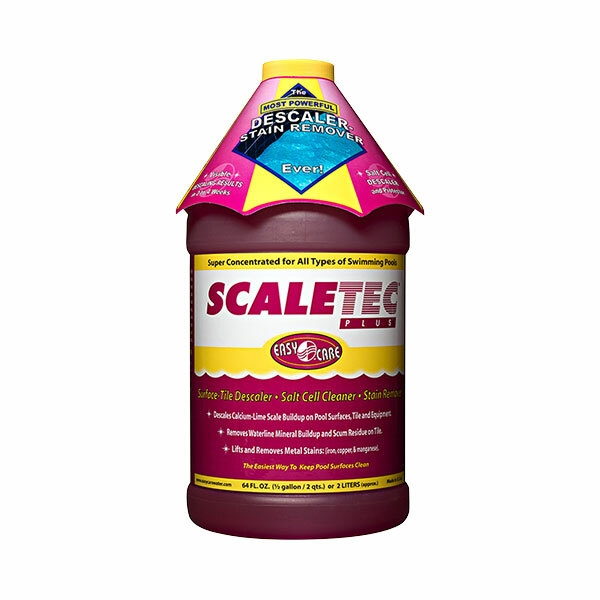 Scaletec Plus® unique Synertec formula involve components that remove both new and old white calcium and mixed composition scales and metal stains. This process involves a combination of super-sequestration, crystal modification – absorption, and threshold inhibition. Scales and stains are both loosen from surfaces and redissolved into pool water which are filtered away or kept in suspension.